Criticism of bloggers may feel like an argument which belongs in the nineties; but the backlash to US Vogue's recent full-frontal attacks underline the media industry's struggle to come to terms with the rising power of digital influencers, writes Nicola Kemp. If the fashion world was once the most impenetrable of ivory towers; digital influencers have successfully staged a revolution. Yet certain editors at Vogue appear to remain in a state of perpetual denial. "You are heralding the death of style," wrote Sally Singer, creative digital director at Vogue, in a somewhat apocalyptic criticism on the rising influence of "bloggers" which has sparked an inevitable backlash on social media channels. In a post Milan fashion week frenzy, US Vogue editors lined up to criticise "bloggers"for the "distressing" "street-style mess". Even brands were in the firing line; Nicole Phelps, director of Vogue Runway, wrote: "It’s not just sad for the women who preen for the cameras in borrowed clothes it’s distressing as well to watch so many brands participate." Sasha Wilkins, the founder of lifestyle blog LibertyLondonGirl.com, says that the comments are both "horribly snobbish and very misogynistic". Pointing to brands such as as Dolce & Gabbana and IWC watches, she says a growing number of brands are investing in digital storytelling both to connect with their current and future audiences. The criticism from Vogue editors belies the fact that in the social media age Instagram is the ultimate fashion runway and media channel for many brands. Indeed, the growing focus on social media influencers and celebrities within the pages of magazines themselves only serves to underline how out of touch their criticism is. According to Wilkins their hypocrisy is hard to swallow from a magazine which has put Kendall Jenner on its September cover and has a continuous gallery of street style on its website. She explains: "Magazines like Vogue were once the gatekeepers of fashion but now the style bloggers have flown up the ivory tower and they are throwing stuff down at them." Wilkins believes the comments underline the tensions facing traditional media brands. "Traditionally print magazines have used digital editions to add value to their print editions. When in reality digital can have so much more impact than print. The fact is people in their twenties don’t read magazines anymore." While traditional media owners have used distance as a key pillar of what constitutes luxury, industry experts say that the rise of social platforms has heralded a shift towards faux intimacy. Ben Tan, executive planning director at Perfect Storm, says that the comments from Vogue represent the tension that comes when "an old elite is being replaced by a new breed". He explains: "In the past exclusivity was measured on how far you were away from the masses and that sense of longing was the mark of what luxury and aspiration was about." However, he believes that consumer expectation has fundamentally shifted and they increasingly crave the intimacy that social influencers offer. The growing role of faux intimacy in digital influence is underlined by the growing focus traditional publications are placing on encouraging their own staff to build their social footprints. In fact, a growing tranche of fashion editors have become Instagram influencers in their own right. "Newspapers and magazines are selling their staff as if they are a commodity," explains Wilkins. In fact many journalists concur that having a personal profile is increasingly vital to get ahead. While many of the most successful digital influencers were traditional journalists earlier in their careers. A fluidity which serves to further underline the flaws of Vogue’s fashion editors somewhat contrived ‘us and them’ headline-grabbing positioning. Harvey Cossell, head of strategy at We Are Social, says that the Vogue editors’ criticism underlines the changing face of influence in marketing. He explains: "It’s traditionally been a very dictatorial style of influence for brands and media owners, but today’s influencers are broader social and cultural forces." However, according to Cossell, this shift does not mean that you can trade one off against the other. "Brands may want that traditional press for validation but the changing face of influence means there is also a role for accessibility. The question is who defines style; is it the influencers or the magazines?" Ultimately, however, these boundaries are often imagined as consumers do not differentiate between the two. While the rise of digital channels have ushered in a new era of democratised fashion some critics have argued that this new wave of digital influencers are simply creating a new elite as opposed to fundamentally disrupting the model. "Blogging used to be the home of the outsider voice, but now it is often the preserve of the beautiful and the wealthy. A combination of money, a photographer boyfriend and beauty dominate and it’s depressing," says Wilkins. However, she counters that the simple fact of being commercially successful does not automatically negate the authenticity and accessibility which have been so key to the rise of digital influencers. "It is crazy to criticise; everyone gets paid and we have always made a virtue of the fact that one day I’m putting the bins out and the next day I’m doing something extraordinary. I’m a normal person that does extraordinary things." Behind the rise of the digital influencers is the fact that entrepreneurs like Wilkins are at at the heart of this centre of gravity of aspiration for a growing tranche of consumers. According to Tan, entrepreneurial spirit and courage are the biggest drivers of aspiration today. He explains: "The courage to rise and fall by your own judgements is the ultimate modern aspiration we aspire to today, which you don’t see in Vogue." For once you skim the surface it isn’t easy to break into the top echelons of digital influence. Without the veil of structure and prestige afforded by traditional media brands, these entrepreneurs are exposed to the judgements of others in a way previous generations couldn’t possibly fathom. 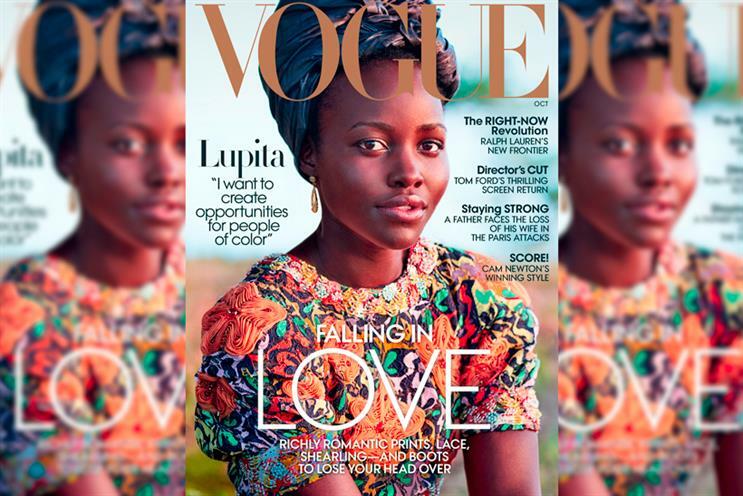 Vogue may have ensured its brand was front and centre in the social media conversation over the past week; but it was for all the wrong reasons. Is the role of the celebrity (in advertising) dead?